The third day in Chile we decided to try one more lagoon nearby, before we left the region the next day. We really enjoyed the fishing for browns and bows on one particular lagoon, but Pipo knew of a really small lagoon loaded with rainbows. The bows were small and plentiful, but eager to eat dry flies. Once we got the boat in the water, and Max and Alex rigged up in their tubes, I started seeing fish everywhere. 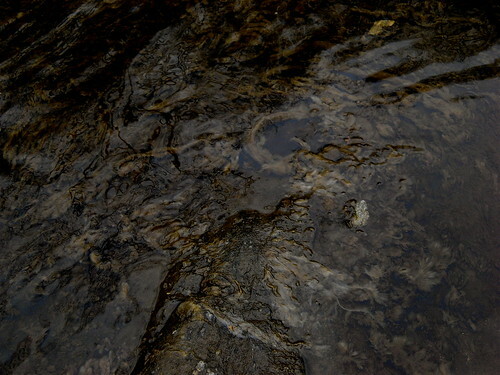 The water was so clear, it was possible to spot trout cruising in the shallows 75-100 feet away. The weed beds thinned to a packed sand bottom, and trout milled around the shadows of the trees. In the shallows the trout actually turned to inspect anything that hit the water, and a few strips brought consistent takes. I felt like I was on a bone fish flat, as singles and doubles passed off the bow. Splashy rises along the shaded shore line put me in the mood to toss a foam beetle. The rainbows were inhaling the size 12 fly, so I switched to a size 6 black foam cricket on 2x. The bows would explode on the large cricket when it splatted on the water. Occasionally the bows would nose the fly, until a few quick strips drew aggressive takes. We all fished big dries, trying to see how big a fly they would take. I know all varieties of Chernobyl and stonefly foam patterns were used, as well as a Hickey’s Condor. 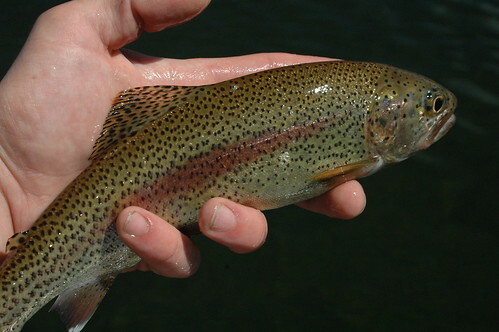 I started stripping my fly like a popper, and found the trout seemed to prefer the fast, splashy retrieve. Max and Alex were in another cove putting steady bends in the rod. They too remarked how funny it was that the fish wanted flies stripped quickly on the surface. We twitched the rod, watching the trout refuse, only to go into a head shaking take seconds later. I tried explaining to Pipo how back in the US, the fishing most comparable to this type of fishing was bluegills in a pond. These trout were incredibly aggressive, and clearly rarely fished over. They were a lot of fun on a four weight, and if you missed a strike or lost a fish, another trout was only a cast or two away. The desire to catch more fish, to see the take and feel a tug on the line, was fading. I filmed a few minutes of casting, strikes, and hook ups. We were content after two hours to head back to the truck. 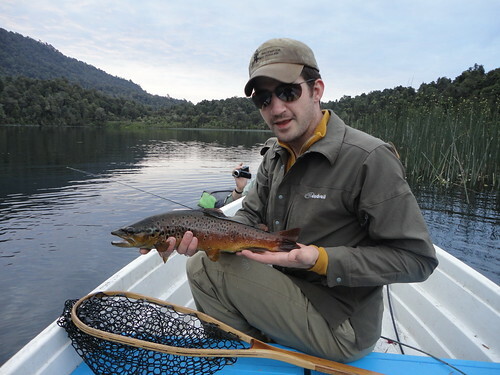 The latest video post features fishing dry flies on a small lagoon in Chile. This entry was posted in fishing report, video on January 30, 2011 by Jason du Pont. In Chile the warm Summer temperatures were a welcome change from the frigid cold in the North East U.S. The Sun’s rays were so strong that it could quickly burn any exposed skin within a few hours. We all quickly learned another reason to wear long sleeves, and it wasn’t to avoid sun burn. The real reason to cover up any exposed flesh was the hundreds and hundreds of blood sucking Tabanos, which would feast on us between the hours of 10 a.m. to 4 p.m. The beginning of our trip in the mountains was the first place we encountered these huge flies, but it wasn’t until we reached the Rio Puelo that we experienced their full wrath. In order to best describe the Tabanos, imagine the biggest horsefly possible, with a long proboscis, but in swarms like Africanized Honey Bees. 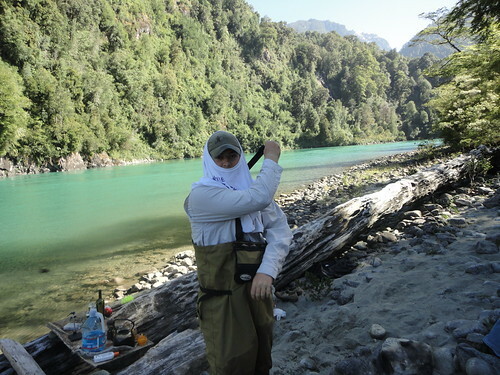 Luckily they couldn’t cut through waders, but they could get through 2 thin shirts, so most of the time we were heavily layered despite highs in the upper 70s. I brought a few Buffs for the Sun, but they became essential to reducing areas the flies could land and bite. The black and orange pests would occasionally find a way to bite through the thin fabric, and some even punched through my waxed cotton shop hat. We converted socks into gloves, and Alex made good use of a tee shirt below. The most unbelievable trait about these flies wasn’t the painful bite or their huge swarms, but that they were tough. We slapped ourselves red, crunched them in our hand, threw them into the water and most of them flew right back into the air. We bounced them off rocks and the aluminum boat, only to see them rebound and take flight. A few hours of the day were just plain madness, and if you got tangled or broke off, you just hoped an extra rod was strung up in the boat. The worst part of losing flies was knowing that you would be bitten incessantly as you tried to tie a blood, a few clinch knots and add some shot. All of those steps took three times longer than normal with the Tabanos. We just flailed our arms to keep moving while changing flies, but the Tabanos got Alex good one day while re-rigging. Fortunately the loop trick and small hook didn’t require cosmetic surgery after the hook was removed. We discovered that while we came at a time when conditions were not the best on the Puelo, we did arrive to ideal conditions for Tabanos. The nuisance flies were not present on the trip they made last year, due to heavy rains. The Tabanos were only around for three weeks of the year, and we were right in the prime week for 2011. I asked Alex and Max before we flew down. “Do I need any bug stuff?” No, no bugs down in Chile was what I was told. Pipo told me that sprays and repellants don’t work anyway, not even pure DEET. We did the only things we could do in these circumstances, fish and make light of situation. We laughed, we yelled out constantly, and often got revenge. My favorite was pet Tabanos on a 4X tippet leash. Late in the day, a moment would occur when something felt different. It took a few seconds to pinpoint, but after reflexively flinching and involuntarily smacking yourself for hours, you suddenly become aware the flies are gone. You nervously peek over your shoulder. Slide your hand over the brim of your hat. The high pitch buzzing in your ears is still there, like your brain suffered sensory overload, and is playing the last noise it heard on a loop. Soon there is no buzzing, nothing hovering in your view, and you can give your full attention to fishing again. A brief chance to fish in peace, at least until tomorrow. The latest video features footage of the dreaded Tabanos of Chile. This entry was posted in fishing report, video on January 27, 2011 by Jason du Pont. The latest press release from MDDNR alerts anglers to the felt sole ban effective March 21st, 2011. Many manufacturers of wading boots are answering the call to help curb the spread of invasives by switching from felt soles and designing better rubber compounds for traction. Simms is leading the industry by switching from felt to only Vibram soles in all boot styles. Simms also produced three different stud designs for anglers who feel they need more traction (many of us used the vibram soles without studs this past year). The Star Cleat features carbide chips welded to a triangular cleat that fits into the rubber sole tread pattern. The Alumibite Star Cleat features the same design, but in a lighter, softer metal. The Hardbite Boot Studs are a more traditional screw design with carbide shot welded onto the screw. One benefit of the Vibram soles is the studs can be removed, or configured differently depending on the desired traction. Maryland is now added to a list of states including Alaska and Vermont that have banned the use of felt effective 2011/2012. A number of states including Oregon, Montana and Missouri are currently debating a ban on felt soled boots. This entry was posted in gear, news on January 27, 2011 by Jason du Pont. The second morning in the mountains we hiked into the lagoon where we left the boat and float tubs from the previous night. The lake was quiet and shrouded in fog, as the sun rose over the mountains. The heavy cloud cover in the sky put a chill in the air. We rigged up and pushed through the path we created in the reeds. Pipo and I headed to the far side of the lake, where numerous fallen trees lined the shore. The water was so clear it was easy to see down eight to ten feet. Tree limbs and thick weed beds looked like perfect cover for big trout. I started fishing with a small olive Zonker. I stripped the fly through the reeds along the shoreline for twenty minutes, and it was obvious the trout were not in the shallows. In deeper water I cast parallel to the shore and let the fly sink at least ten seconds over submerged weed beds. On the third cast I felt the sudden resistance in my retrieve and hooked a nice brown. I landed the fifteen inch brown, which was one of many “cookie cutters” caught in this lake. The lake wasn’t known for big trout, but I felt like throwing a big fly anyway. I switched to a five inch long sculpin pattern with long rubber legs, rabbit and arctic fox fur. The fly had a lot of movement in the water, and dove deep with large weighted eyes. I switched colors a few times, and altered my retrieve speed. For the better part of two hours I worked the fly off reed points, logjams and weed beds. I felt a few takes, but got caught between strips. I had encounters with two nice browns that appeared from the dark depths and followed the fly to the rod tip, but spooked when they saw the boat. Max and Alex worked the shoreline nearby, and hooked up regularly. Max was using purple leeches, and I filmed him fighting and landing some trout. Alex caught trout on damsel nymphs and buggers, and mentioned catching only browns in one corner of the lake. I switched back to rubber legged nymphs, opting for quantity over quality, and picked up a few rainbows. We weighed our options for the afternoon at lunch time, and despite the desire to stay and keep fishing this productive spot, we thought we should try our luck elsewhere. 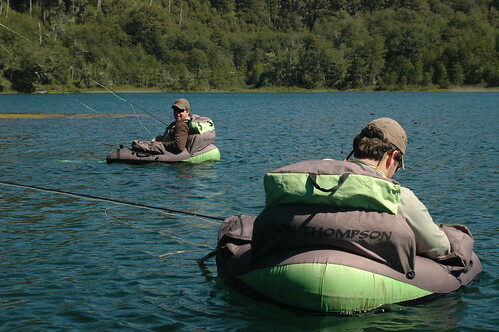 The latest video post features more fly fishing on a mountain lagoon in Chile. This entry was posted in fishing report, video on January 21, 2011 by Jason du Pont. A few days after the New Year, Alex and I boarded a plane bound for Chile. The plan was to meet up with Max, who was visiting family over the holidays, and drive into the mountains to fish some lagoons (lakes). 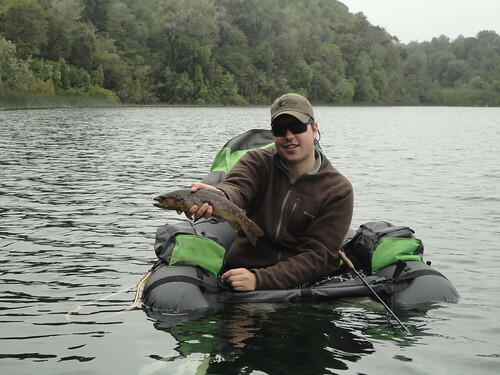 Our guide, Pipo, who fished with Max and Alex the previous year, picked us up in Osorno. We bought the supplies, gas, and packed our gear, while he offered us transportation, the use of boats and float tubes, and shared his secret spots for an extremely reasonable fee. The boat and truck were loaded to full capacity, and we drove for hours off paved highways onto narrow dirt roads. Snow capped volcanoes loomed over us as we snaked our way through a jungle type atmosphere with seventy degree air temperatures. We passed many incredible rivers and streams with only a passing glance, because there just wasn’t enough time to stop. We arrived at our mountain lodging, an empty ski resort, and unpacked the gear and groceries. The sun didn’t set until close to 10 P.M., so we had a few hours of fishing. 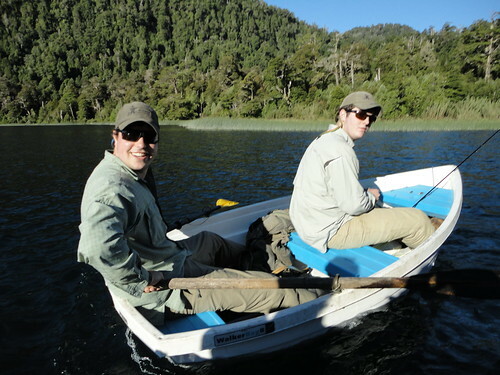 Once the boats were in the water and we rowed toward the tall reeds, it finally sunk in that I was fishing in Chile. I laid a cast up against the reeds with a Polar Zonker on a sinking tip line. Slow strips from the reeds to the drop offs brought hard strikes from the rainbows in this lake. The majority of the bows were 11-16 inches long, but thick and beautiful. The three of us quickly got into fish and sated the itch to put a bend in the rod. We took turns rowing, and watching the casts land in prime spots. We waited as fish began to rise to small caddis, but no major hatch frenzy materialized. The air became cooler as the sun dropped behind the mountains, and we pulled ashore in the dark. The following morning we checked out a sweet looking river in a lush forest (more on that in another post), but found ourselves bushwhacking with one boat and float tubs in the afternoon to reach another lake. This lake was the only one nearby with a good mix of bows and browns, but it was hard to reach. I was a little apprehensive about fishing the still water again for trout, since we only had so many days to fish, and the lakes didn’t beckon with the roar of falling water. The intrigue was there though, and only grew as we witnessed no tracks and tight, brush choked trails. Pipo and I worked the dinghy down a long steep incline, while Max and Alex readied the float tubs at the lake’s edge. The reeds were almost impenetrable, but we hit open water once Max and Alex cleared a path. This particular evening was one of the highlights of the trip for me. The trout were holding along the reeds, and thick weed beds. Damsel and dragon fly shucks covered nearly every reed above the water’s surface. Splashy rises, and watching the reeds sway as trout swam through in search of food made for easy targets. I rigged a large olive Girdlebug with rubber legs on 2X and cast the sinking line into the reeds. A few quick hook ups on chunky rainbows confirmed they were eating nymphs instead of the larger streamers I fished yesterday. I was hoping for a nice brown and wasn’t disappointed when after a hard strip set, one fish dove deep. 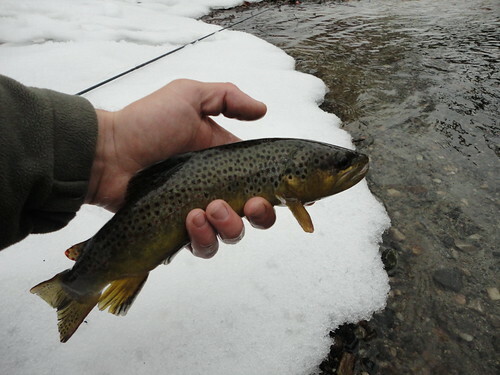 I brought the thick brown to the net, and after that fished without much interest in filming or photos. There was no doubt that these moments would not soon be forgotten, even without the aid of technology. The next few hours passed quickly with laughter and the whining of our drags echoing across the lake. The last hour of light neared and if we weren’t doubled up, one of us had a fish on the line. The trout were a consistent 12-16 inches, and hungry. Before nightfall arrived we already decided we would scratch our plans to fish a river the next day, and return to the lake again. We recounted the highlights of the day while our dinner cooked over red hot embers. 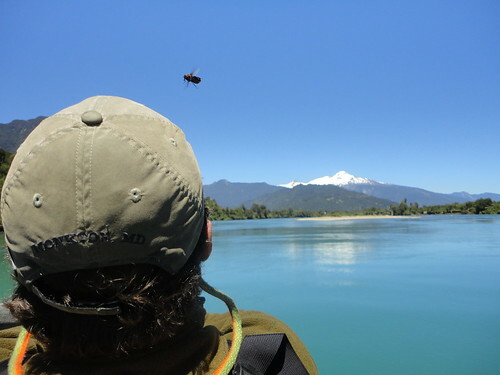 The latest video post features fly fishing lagoons in Chile. This entry was posted in fishing report, video on January 18, 2011 by Jason du Pont. Influential in the development of modern environmental ethics and in the movement for wilderness conservation, his ethics of nature and wildlife preservation had a profound impact on the environmental movement, with his biocentric or holistic ethics regarding land. He emphasized biodiversity and ecology and was a founder of the science of wildlife management. Are you interested in doing your part to protect your River? Membership, volunteer and internship opportunities await. Do you have a skill, service hours or personal time to give to the cause? This entry was posted in news on January 11, 2011 by Theaux Le Gardeur. Thanks to Sera Zegre for including us in the following Acid Mine Remediation Report that was recently presented before the Maryland State Water Quality Advisory Board. 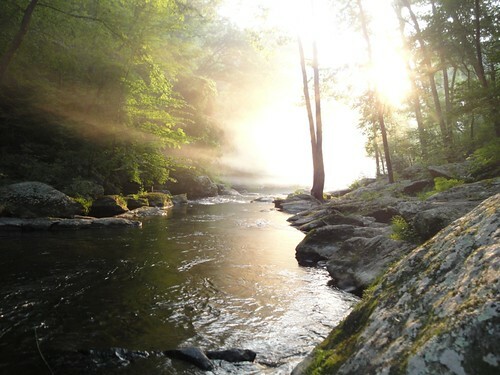 On behalf of all of us at Downstream Strategies, I want to thank you for your participation in our study, and inform you that Downstream Strategies has released the report: The Benefits of Acid Mine Drainage Remediation on the North Branch Potomac River. You have each provided invaluable assistance with the study context and our survey. An opportunity exists for the State…to protect waters of the state by continuing remediation efforts at the current level. If they get spooked over [water quality]…if the dosers are not in operation and the fisheries decline…they’ll go elsewhere. If remediation on the Potomac River efforts are halted, the loss in income formerly derived from a viable and well-recognized fishery (not to mention a certain loss in out of state license fees from these residents of the aforementioned states that currently view the Potomac as a “destination” fishery) will occur and the effects will be very real to small business operators who base their livelihood on healthy waters of the state. We see anglers every week on their way to western Maryland fisheries. If we have 15-20 people in the shop, easily a quarter to a third of our customers are headed out there [to the NBP and Savage Rivers]. We’ve seen a decided decrease in anglers travelling to storied destination streams in the mountain west in favor of fly fishing and exploring home waters within an easy drive. We are selling gear specific to that river. For example, they sell fly rods of certain length and stiffness; due to slick rocks, they sell studs to put in shoes and wading staffs. The gear they purchase is unique to the river and can include items that are used with intent to pursue larger fish in the more open waters of the Potomac. The regional angler with the NBP and Savage Rivers as a destination allows us the opportunity to sell different types of gear. 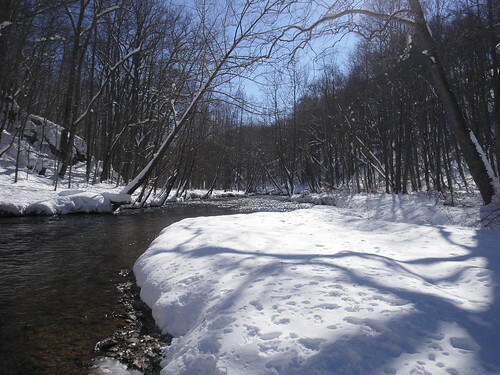 The Gunpowder River is now flowing at 144 CFs, is 36 F and clear. This increase in flow should provide plenty of oxygenated water for the fertilized eggs on the redds and push some of the Didymo that has been accumulating in the upper catch and release section downstream. 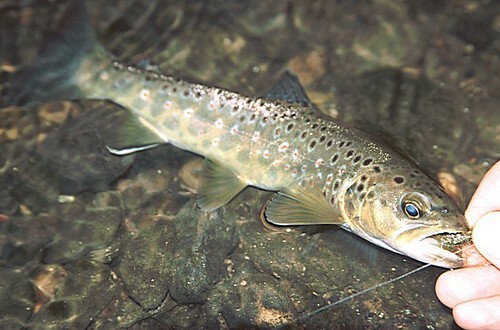 An added plus is that the river water should be warming a bit at the higher flows so we’re that much closer to fly fishing for wild trout with imitations of blackflies and stoneflies. With lows in the teens and twentys this week, sleep in and start out midday with grey midges and stonefly nymphs. The flows are high enough now to drag out the North Branch-sized streamers and give them a go…Be sure to bring along and extra pair of gloves-you’ll need them! 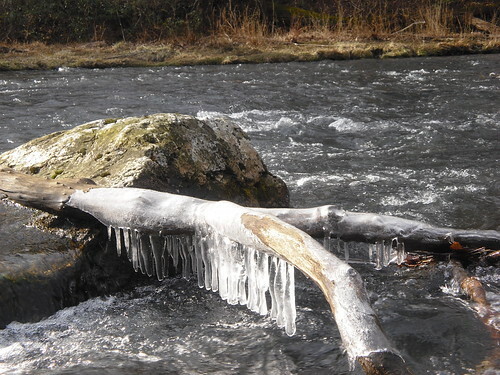 This entry was posted in fishing report on January 10, 2011 by Theaux Le Gardeur. Thanks to Josh for sending along the link to Grist that recently published an article titled, Weeds, Rock Snot and Lionfish a menu for ‘Invasivores’ that indicates that Didymo may well be found on a sustainable menu in the future. The article was prompted by a story titled; A Diet for an Invaded Planet, Invasive Species which appeared in the New York Times under, you guessed it, sustainability. Did you know that didymo was edible? This entry was posted in news on January 8, 2011 by Theaux Le Gardeur.